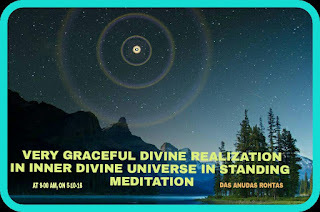 " God " is realized at 9-00am on 5-10-2016 during standing Meditation before the Temple in Home, In inner divine universe. Only self realization has value of divine energy, realizing in our inner divine universe. 3. Because, We can faith on our self realization only. No body can faith till they realize himself divinly, in this physical World. 4. It is the time, when Sun is arising up in the sky in outer world universe at 9-00am, while we observing all these, divine Planets, Stars, Divine Sun together in our inner divine universe. 5. Sun is unlightining the inner universe divinly. 6. There are Stars are twinkling like " Jugnu " in inner divine universe. 7. Sun spredding His Miracly divine Energy with the help of divine Rings (original divine Power of Rings ) this scene is looking very, Very, Graceful.
" Self-Divine-Realization Is True Love To God "
Self Divine Realization it may be outer World or inner Universe, many Emperors Empty there Chairs. Many Kings and Queens, Prince and Princess, many Educated and Qualified, Gentlemen and pious ladies, many Yogi Purush and yogini, Daties and Divya Purush, Avtari Purush and Rishies, Munies, Saint, and Sadvies, Brave Men, Austrologers and Richest men and Land-Lords person, " Threw out there Pricious cloths and valuable Crowns and become true Devotee of God," YOGI " in this wonderful Physical World in every Yuge, in this Beautiful-Miracle-Mayavi-Divine-Shristi ".